Headquartered in Tulsa, Oklahoma, IPHI Books is an independent publishing house. We focus mainly on the fantasy genre, but we enjoy any story that takes convention and tilts it on its axis. Life is a chaotic mix of the mundane and the extraordinary. IPHI Books likes to see this reflected in its art. In the pages of our novels, reality gets in the way of a good story, creating something more organic and dynamic. Adventure is found in what we make of the situations we find ourselves in. Life is stranger than fiction, and is perhaps a little bit IPHI. Minni Masterson has reached a point in her life where she has to make a decision: fight a gold dragon or deal with her failing relationships. Fighting a dragon is easier. 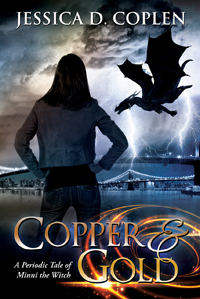 Copper and Gold is the first book in The Periodic Tales of Minni the Witch. Minni is pretty sure she passed culpability somewhere between not calling 911 and kidnapping a member of the British monarchy. She's still going to find a way to blame the dragon. 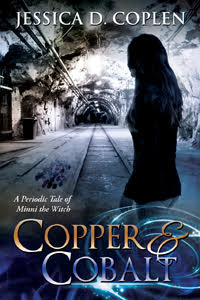 Copper and Cobalt is the second book in The Periodic Tales of Minni the Witch. Det. Diana Thanatos Birch is named for her father, Death Itself. When a murder looks too much like suicide, Diana has three days to prove otherwise. Since she can't exactly put Death on the witness stand, she'll make her case the hard way. Blood Moon, Werewolves, and Minni Masterson. What could possibly go wrong?